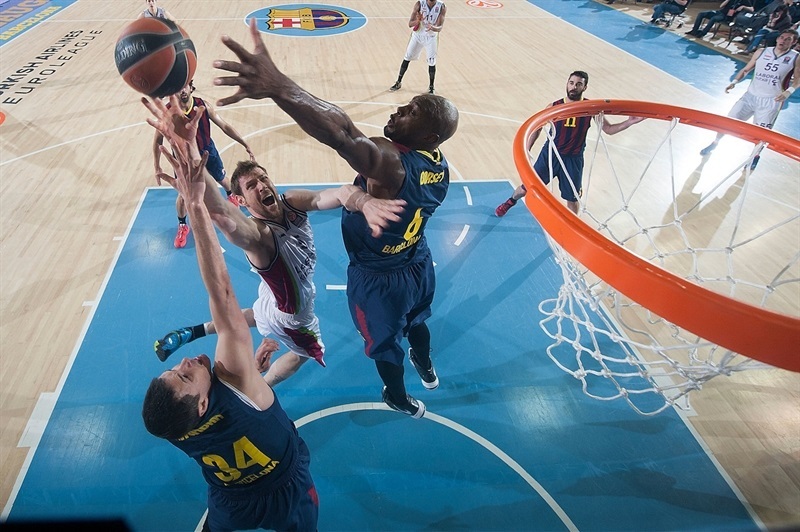 Laboral Kutxa Vitoria finished its 2013-14 Turkish Airlines Euroleague season in style by downing FC Barcelona 86-97 on the road in Group E on Thursday. Laboral finished Group E with a 5-9 record and snapped Barcelona's 31-game Top 16 home winning streak, an all-time record. Barcelona was first in Group E with a 12-2 record. 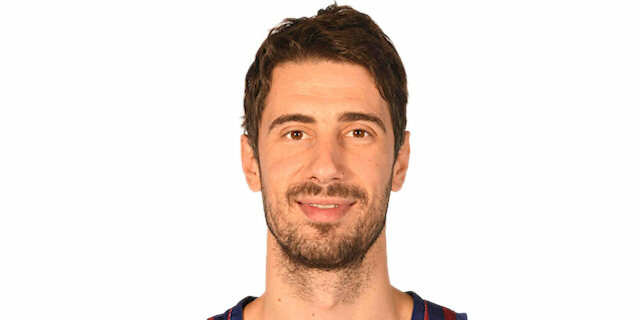 Andres Nocioni paced the winners with 37 points - a Euroleague career high, the most points scored by any player in the league this season and a new record for a visiting player at Palau Blaugrana. 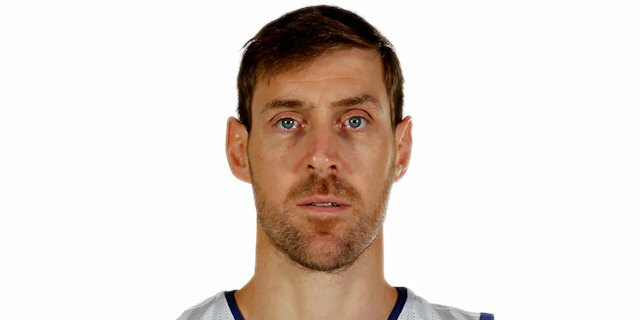 Fernando San Emeterio added 18 while Tibor Pleiss had 12 for Laboral. 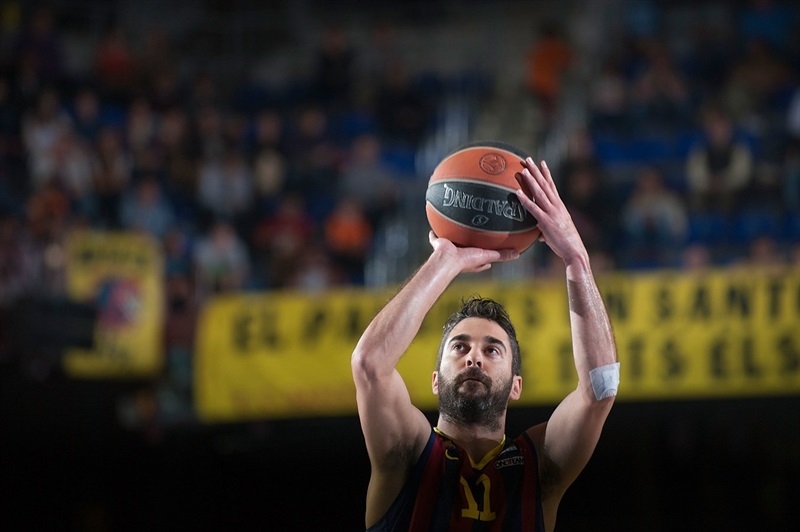 Juan Carlos Navarro led Barcelona with 25 points – including the 500th three-pointer of his illustrious career. 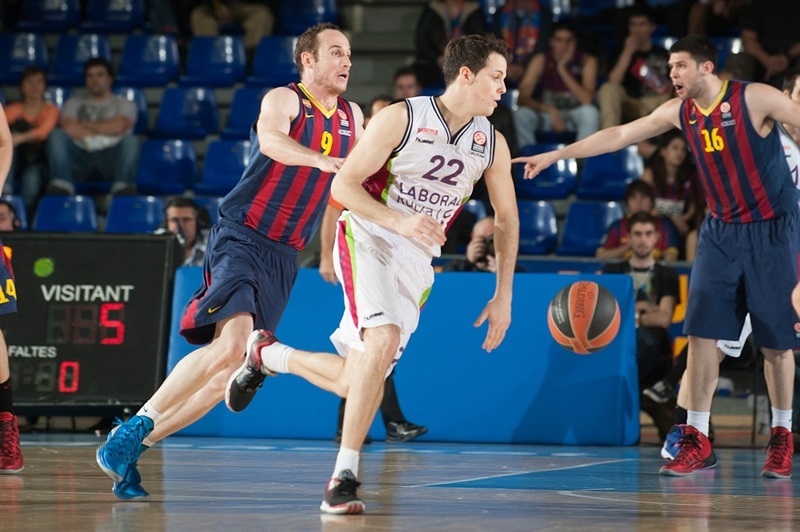 Bostjan Nachbar added 18 points, Marcelinho Huertas scored 15 and Ante Tomic 11 for the hosts. Navarro and Nachbar combined for 33 points on 8-of-8 three-point shooting in the first half. Barcelona hit 10 of its opening 11 three-point attempts to lead 50-35 at halftime. Vitoria found a go-to guy in Nocioni, who had 19 points in the third quarter, 11 of them in a 0-18 run that brought the guests back to life. A free throw by Lamont Hamilton gave Vitoria a 60-66 edge after 30 minutes. An outstanding Nocioni boosted the guests' lead to 64-81 and Vitoria never looked back. 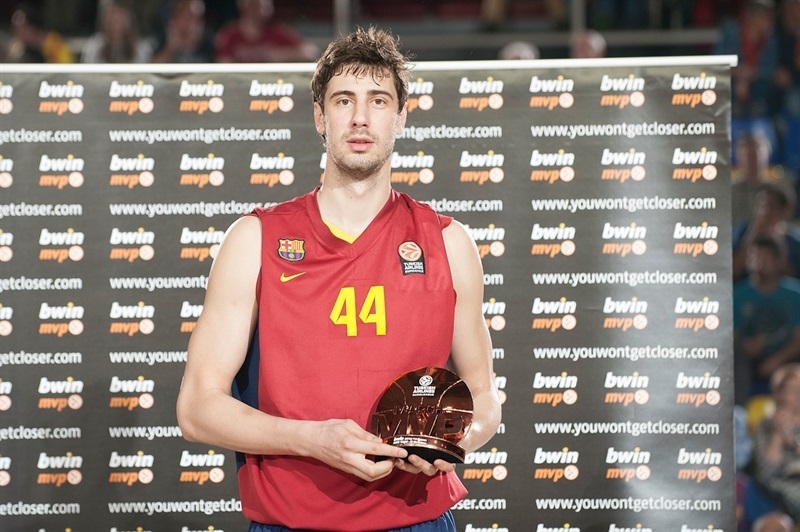 Tomic received his bwin MVP for March award in a brief ceremony before the game. It was the first ever game in European basketball to generate content on Google Glass - Huertas and Nocioni wore them in warm-ups before the game, Laboral Kutxa delegate Patxi Sanchez and Barcelona press officer Carles Cascante had them during the game, as well as referee Tolga Sahin, who wore them in the second and third quarters. First quarter: Navarro hits 500th three-pointer! 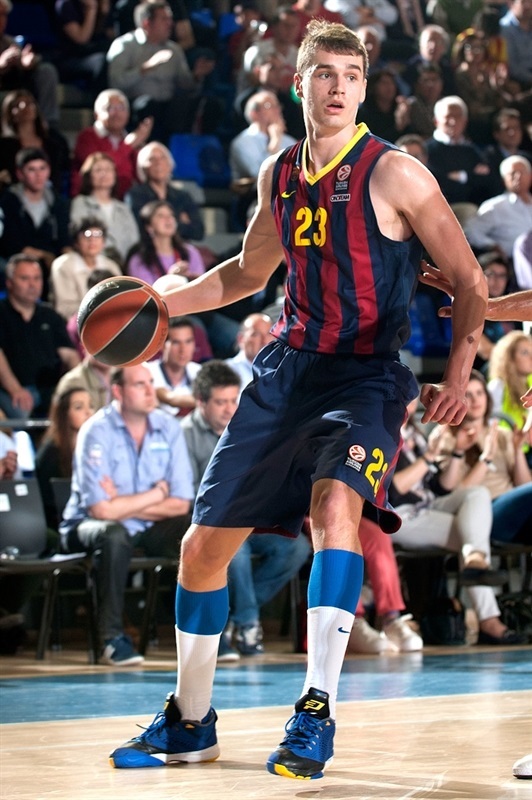 Marko Todorovic, in his first start this season, got Barcelona going with a reverse layup. 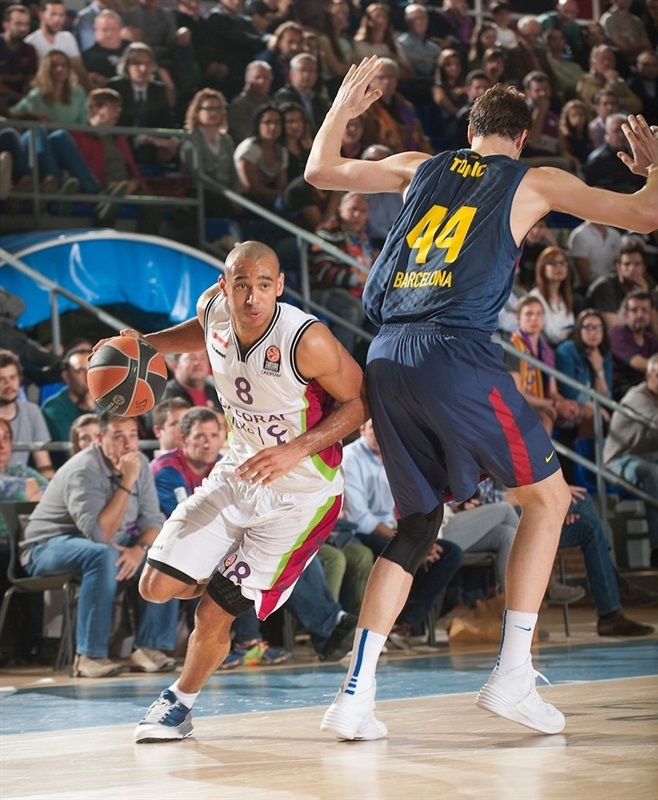 San Emeterio took over with a driving layup, which Marcelinho Huertas bettered with a three-pointer. Thomas Heurtel and Kostas Papanikolaou also struck from downtown and a layup by Pleiss kept Vitoria within 8-7. After Navarro made free throws, Leo Mainoldi joined the three-point shootout. A close basket by Huertas put Barcelona back ahead, 12-10. Navarro hit more foul shots. 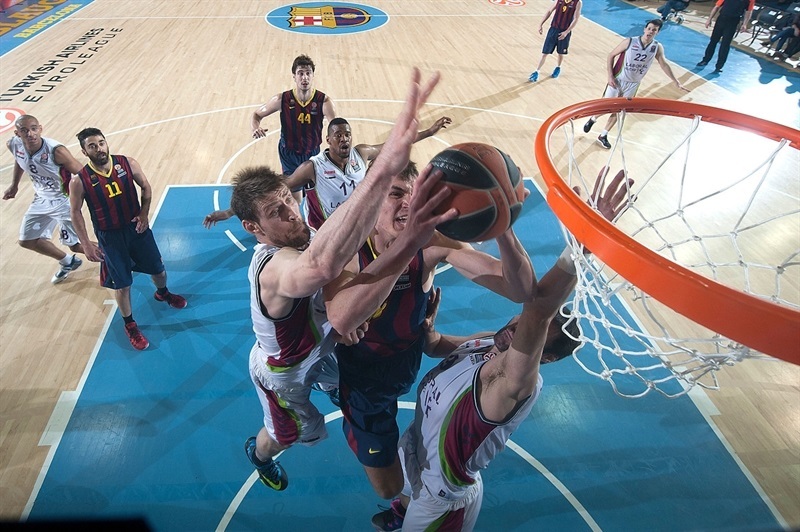 Pleiss hit a jump hook in the paint and Tomic gave Barcelona a 15-12 edge. After San Emeterio nailed a triple in transition, Navarro answered from downtown. A layup by Lamont Hamilton kept Vitoria within 18-17. Navarro fed Victor Sada for an easy basket, hit foul shots and buried a three-pointer - the 500th of his storied Euroleague career – for a 25-19 Barcelona margin. San Emeterio insisted from downtown, but so did an unstoppable Navarro to give Barcelona a 28-22 lead after 10 minutes. Navarro nailed another triple off the dribble early in the second quarter. Peppe Poeta made free throws that Nachbar bettered with a three-pointer to make it a double-digit game, 34-24. Nachbar sank another three-pointer and soon added a six-meter jumper to brake the game open. Adam Hanga tried to change things with a jumper that an unstoppable Nachbar improved with another triple. An alley-oop slam by Mario Hezonja ignited the crowd at 45-26. 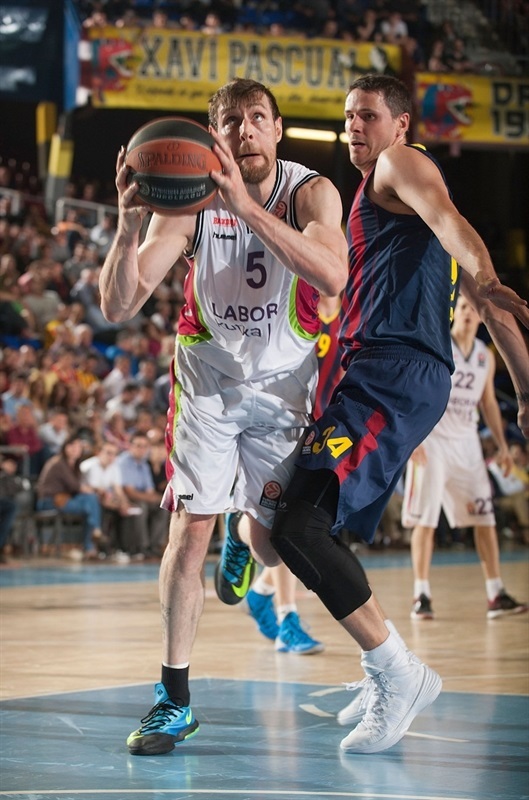 Pleiss dunked but Nachbar took over with a three-pointer - his team's 10th in 11 attempts – for a 48-28 Barcelona margin. Nocioni stepped up with consecutive baskets, as Barcelona tried to open the floor with Todorovic and Maciej Lampe together on court. San Emeterio made free throws that Huertas matched with a close jumper. Nocioni split free throws to fix the halftime score at 50-35. Huertas sank a second-chance jumper soon after the break, as Vitoria struggled to score. Pleiss stepped up with a big basket in the low post, which Tomic matched with a dunk. Huertas fed Tomic for a close basket, but a three-point play by Fabien Causeur and a bomb from downtown by Nocioni gave Vitoria some hope at 56-43. Nocioni kept pacing the guests with a three-point play and a jumper by Causeur brought Vitoria within single digits. 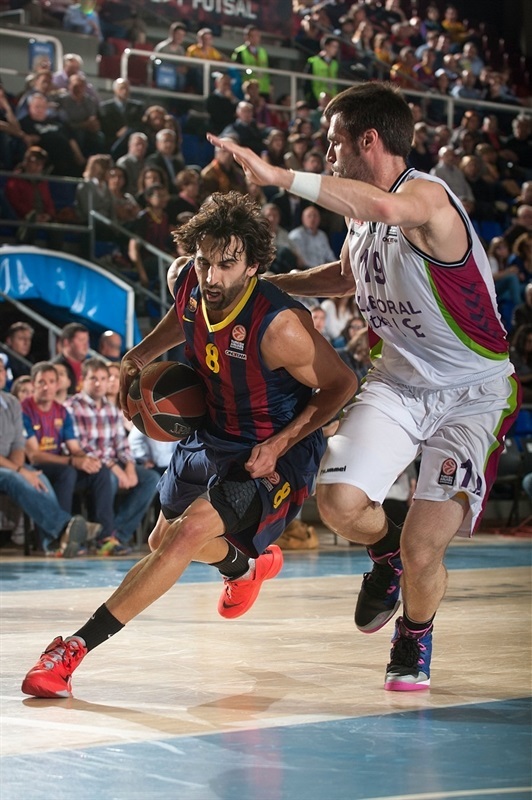 An uncontested layup by San Emeterio caused Barcelona to call timeout at 56-50. Nocioni struck from downtown and banked in a turnaround jumper to make it a 1-point game, 56-55, after a mammoth 0-18 run. 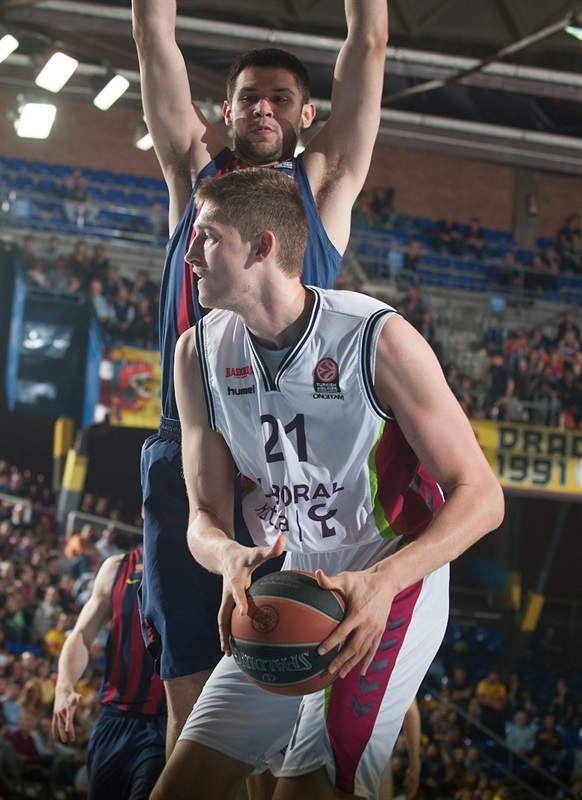 Abrines stepped up with a close basket, which Hanga matched with a one-handed floater. Nachbar shined with an up-and-under layup. Nocioni sank a running shot and a layup by an unstoppable Nocioni completed the guests' comeback at 60-61. Nocioni added a wild dunk-and-foul and a technical free throw before Hamilton gave Vitoria a 60-66 edge after 30 minutes. Hanga nailed a corner three-pointer early in the fourth quarter. San Emeterio hit a technical free throw to give Vitoria its first double-digit lead, 60-70. Nachbar hit a four-meter jumper, but Poeta answered from downtown and San Emeterio added a driving basket for a 62-75 Vitoria lead with over seven minutes left. 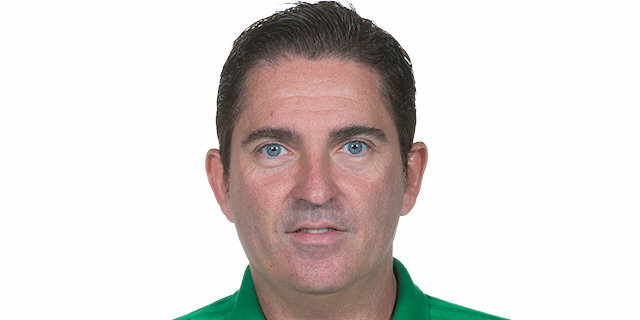 Huertas hit his trademark running jumper that Nocioni bettered with a triple coming off a screen and soon added a layup-plus-foul, which sealed the outcome, 64-81, with six minutes left. After Tomic dunked, Nocioni sank a one-handed jumper. Free throws by Navarro kept Barcelona within 68-83. Navarro shined with an acrobatic layup, but Hamilton scored around the basket. Hezonja made it a 13-point game, but the outcome was fairly clear. Heurtel hit a jumper and free throws by Nocioni gave Vitoria plenty of time to celebrate a great win in come-from-behind fashion! "No matter what the score was, I want to congratulate my players for the Top 16 we had. We managed to finish first in a really difficult group. We left behind the second stage of the competition and face the playoffs as a first-ranked team. As for today, both halves were really different. We dominated in the first half and were brilliant on defense and offense, we played really well and both the score and the teams' index ratings reflect that. In the second half, it was similar to Game 2 of the playoffs against Panathinaikos in 2011. We had a big lead and things we could not understand started to happen. We were out of the game and our opponent gained more and more confidence. We lost our defensive and offensive focus and from that moment, we crumbled. We earned the right to make this game a preparation one, we have to use this experience to avoid it happening again. We cannot stop playing defense or doing well on offense. We had 10 three-pointers in the first half and none after the break. We found open shots that did not fall in and they started to play with more intensity. We stopped playing our game, but it was good for us to get ready for the playoffs." "Nocioni had a brutal game, I don't find any other words. We had a bad first half, but felt that we had to give the team a push in terms of responsibility and the team answered very well. We had a spectacular second half, with much more defensive activity. I hope this game will be a turning point for us. It is unusual because of the first half score, having to rally from a complicated situation and especially because we did it with great defense in the third quarter, which led to fast break points. We brought our confidence back in five-on-five offense and outside shooting, we were focused to attack their defense. The key was allowing just 10 points in the third quarter. Everybody contributed; we adjusted our defense against Navarro, who had a spectacular first half. We scored 97 points, but allowing just 10 in the third quarter was more important." "We lacked concentration in the second half and our playing level went down on both defense and offense. We have to improve right away because we have very, very important games ahead of us. It is our fault - not the referees, not anyone else. We have to fight and improve our game to start winning in the playoffs. We cannot lose our focus and energy complaining. Our goal was to get good vibes. We have to prepare for the next games and be more focused." "We had a bad second half. We thought that we would win after leading by 15 at halftime, but we have to bounce back right before Game 1 of the playoffs. We were totally disconnected in the second half. We have to watch the video, but it was a matter of attitude and concentration." "This game is good for our confidence and for the Spanish League, which is where we have to start playing better and winning games. The rim was wide open for me and I personally challenged some of their players, which allowed me to be more motivated and improve my playing level. It is one of these nights is which a player hits many shots. It happened to me more often when I was younger and now... it doesn't happen that often. My previous scoring record - against Benetton Treviso - was a closer game and we fought hard. It meant much more. We have proved to be a team without the mental maturity to play a game like we did today at Palau Blaugrana, come out in the following one and play the same way."